We all need a little bit of sun. We travel places, go for a run in the morning, play football, go for a long trek, and perform other such outdoor activities. These activities result in your skin to get a little sun-kissed. Before you know it, the sun has slapped on a new colour complexion on your body. It seems like an inevitable thing to get tanned once you step out of your house. Sometimes this subtle tanning can contribute to a radiant glow. But, that glow only lasts for so long before your complexion is darker than usual. Fortunately, there are ways to prevent excessive tanning. The regular cleansing, toning, moisturizing, and a generous application of sunblock on your body works – only if this ritual is performed regularly. For those do not have the time to do it on a daily basis, you can just apply the sunblock with SPF strength of nothing less than 30. You can also cover yourself with a scarf, wear protective clothing like long-sleeve shirts, sunglasses, a hat, socks to prevent tanning on your feet. 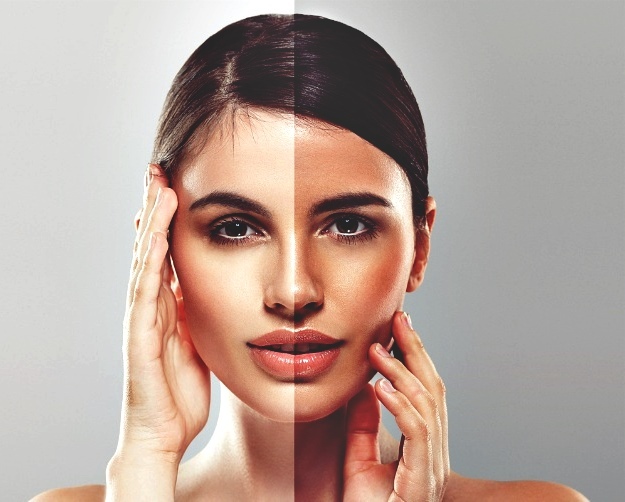 The reason your skin tans when you are out in the sun is because your skin produces a pigment called Melanin to protect your skin cells from damage by the UV rays of the sun. However, with a constant extended period of exposure to the sun, it could lead to Melanoma (skin cancer). Therefore, it’s imperative to take utmost care while you enjoy your time in the sun. If you’re in a situation where you’re way past prevention and already have a full-on suntan, we have a few solutions for you. These solutions may have been prescribed by your mom or grandmother previously. Below listed are some natural home remedies that you can apply to the tanned area. Take the required amount of lemon juice and honey, in equal parts, in a bowl and mix it well. Apply this mixture on the area exposed for long hours under the sun for about 20 minutes and then wash it off. You can apply rose water to the area too after washing the mixture off; it’s a great toner. Use this remedy daily for the tan to fade away gradually. If you wish to keep it on longer than necessary on certain days where the sun exposure was too much, it will work too. Aloe vera works wonders for suntan as much as it does when you have a sunburn. Extract the raw aloe vera pulp and apply it on the tanned area. Let it dry on your body, approximately 10-15 minutes and later wash it off with regular temperature water. The remedy is also good to slow ageing. Both these ingredients are essentially the best to treat suntan. Mix equal parts of sandalwood and pure turmeric powders with rose water to make a slightly thick paste. Apply it to the area and leave it on till it dries. Wash it off later with cold water. You can also substitute sandalwood for gram flour. It leaves the tanned area feeling smooth. However, like most home remedies, it takes a good amount of time for the results to finally show on your skin. Here are some instant and permanent medical solutions that will get rid of the skin tan. The most effective way to remove tan immediately, it is a non-invasive and a completely non-surgical treatment that repairs and regenerates the skin cells anywhere on your body. A Q-Switched Nd YAG laser is used to remove any tan, dark spots, close any open pores, pigmentation, fine lines and much more. The results are almost immediate, the results are long-lasting, and the side-effects are close to none. A non-surgical procedure primarily used to exfoliate and regenerate healthy skin cells in areas such as the face and neck, chemical peels get rid of the tan in a certain number of sessions as well. However, it needs to be done under the supervision of a highly-qualified and trained dermatologist. Some of the commonly used chemical peels are Salicylic Peel, Glycolic Peel, and Lactic Peel. This form of treatment uses exfoliation to reduce tanned skin but removing all the dead cells, dry skin, and other debris. A regular scrub does that too, right? It goes deeper than the conventional scrub because the crystals create a vacuum and suction effect. In this way, the tan leaves your skin and you get your natural skin color back. It also boosts collagen and opens pores. Tanning is something that shouldn’t be taken lightly. Preventive measures and treatments should be done to ensure it does not lead to Melanoma. Tan removal treatments have gained popularity, and it is best to go to a good skin clinic for such procedures.